"You'll talk, Doctor, or these young sprigs will die for it!" Another decent episode here which turns the cogs of the plot and moves it towards a confrontation in the final episode. DOCTOR: Yes, yes, yes, that's very strange. And very disturbing. KEWPER: What do these cards mean? DOCTOR: Well, I'm afraid they're rather unpleasant. Yes, the first one represents yourself, innkeeper. KEWPER: I am no knave, sir! DOCTOR: Well, the cards have it so, sir. DOCTOR: And the second is master Cherub. JAMAICA: See a dagger? That's Cherub right enough. DOCTOR: The third is the king. The blackest villain of them all. DOCTOR: Yes, and that is death itself. KEWPER: What, Pike? And this one, the Jack of Diamonds, what is he? DOCTOR: Well, I'm afraid I have no idea about that, sir, but I can assure you he will triumph in the end. KEWPER: Ah, 'tis all madness. DOCTOR: Well, you may call it what you wish. I know it's only cards, but sometimes they tell the truth. JAMAICA: About any man, like me? DOCTOR: Oh, yes indeed. Yes, yes. Aren't you afraid? JAMAICA: Me? Jamaica ain't afraid. DOCTOR: Very well then, my friend, shuffle for yourself and let's see them reveal your own fate. JAMAICA: Captain, they tricked me into it. I swear it was no fault of mine. PIKE: Aargh, ye black-souled scum! Escaped! PIKE: I'll tear your liver out and feed it to the sharks, ye sea slime. JAMAICA: It was the old man, Captain. He cast a spell on me, I swear it. PIKE: I'll cast a spell on ye, me pretty death's-head. A spell that'll run from ear to ear. Escaped! JAMAICA: 'Twas the black arts, Captain. JAMAICA: Spare me, Captain. Spare me. PIKE: I'll keelhaul ye from here to Port Royal. Where did they make for? JAMAICA: I know, Captain. I know. PIKE: Then speak, boy, while ye still have breath. JAMAICA: I heard them speak, Captain. They said about going to see the Squire. PIKE: Ah, that buffoon, what good'll he be to them? JAMAICA: They said that he was the law. PIKE: Aye, had he a will he'd call the militia, but I doubt he'll do that. JAMAICA: Captain, do you think he would lay a trap? JAMAICA: So we have to surprise them, Captain. PIKE: Ye speak straight, Jamaica. They expect us tomorrow night at two of the clock. JAMAICA: Then, we must go tonight at one. PIKE: Jamaica, ye'd have made a fine skipper but you're short on guile. Any dark of the night they'll expect us. We'll spike 'em. We'll land by day. Some will go direct to the church and loot the smuggler's horde. Me and Cherub will seek Avery's gold. JAMAICA: Aye, Captain, plunder the inn, the village, and the Squire's fine hall. PIKE: Aye, it will be a merry night, but not for ye. JAMAICA: Captain. Captain. I beg thee. No! No! No! Ahh! PIKE: Fare ye well, Jamaica. The image of the cards, which have been used to fool Jamaica, being scattered round his body is rather striking! 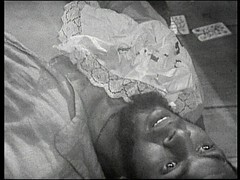 Jamaica's death, fortunately for us, is one of two scenes from this episode preserved by the Australian censor, the other being the close of the episode which I used screenshots from above. 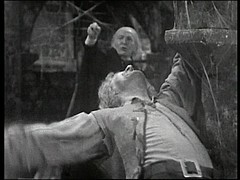 Reunited with his friend, who in turn have been freed by Blake, the Doctor partially cracks the riddle set for him in episode one by Churchwarden Joseph Longfoot. This is the Deadman's secret key: Smallbeer, Ringwood, Gurney. DOCTOR: What did you say, dear? DOCTOR: No, no, before. These names. Yes, yes, that's it! DOCTOR: Yes, of course. Dead man's secret. DOCTOR: Yes, yes, of course. That's the answer to the puzzle. Yes. All these dead people. BEN: What, here in the graveyard? DOCTOR: No. No, not here. POLLY: Hey, in the crypt! DOCTOR: Yes, my dear. Exactly! Good heavens, well, you are inspired. Come on, quickly. POLLY: What was the secret the Churchwarden told you, Doctor? DOCTOR: It was some kind of rhyme. Now, let me see. Dead man's secret key. Ringwood, Smallbeer and Gurney. BEN: Dead man's secret. Well, that means names on tombstones. But how does that help? DOCTOR: Well, we must find these names, mustn't we. Yes, that'll be the first step. DOCTOR: Well now, we've found our three names. BEN: Well I'm blowed If I can see how it helps. DOCTOR: Yes, of course, yes. It would help if we found four names. BEN: What, another dead man's name? DOCTOR: Yes, exactly. Yes, exactly. POLLY: What are you talking about, Doctor? Tell us. .... at which point they are interrupted by Pike and the Squire. The Australian censor isn't the only preserver of this episode though. 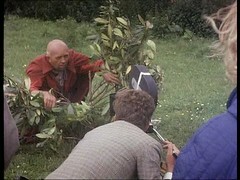 In the middle of the colour 16mm film shot at the farm location there's a shot of Cherub hiding behind some bushes which nearly exactly matches a telesnap from the episode! .... which reveals said Pirate to be a familiar face: It's Doctor who's regular stunt co-ordinator Derek Ware as The Spaniard! 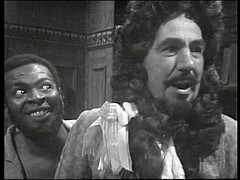 Ware had been involved with Doctor Who since the very beginning fight arranging An Unearthly Child and turning up as a fight arranger/stuntman in episodes since. He's in charge for the big battle in the next episode. 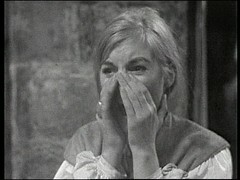 The Smugglers is the first Doctor Who directing job for Julia Smith. An extensive career in television led to her directing many shows, including several soap operas, and being one of the creative forces behind the development of EastEnders & Eldorado. 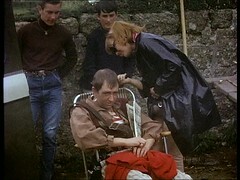 Her co-creator on those shows was Tony Holland who we saw as the Third Assistant in The Savages part 2. 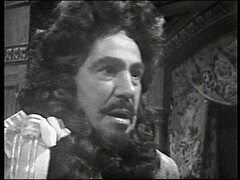 Smith will be back later this season in charge of The Underwater Menace. There's two big factors that come into play here: what the weather is like outside and what's on the other side! In the shows last years it was scheduled opposite Coronation Street, in a move designed to kill it, but I can't say what was going on in 1966 although contemporary reports suggest it was quite sunny, and possibly warm, for the time of year. The next time a lower viewing figure was achieved was in the middle of summer in the midst of a rather long story! 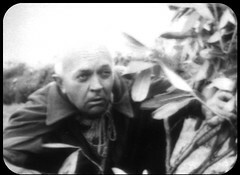 Other episodes of Doctor Who have recorded viewing figures lower than An Unearthly Child 1's: The War Games 6 & 9 (4.2m & 4.1m) also feature in the list, again shown in high summer. Meglos 2 (4.2m) and State of Decay 3 (4.4m) are the next to feature chronologically: at this point ITV was running it's smash hit American import Buck Rogers in the 25th Century opposite Doctor Who so the initial half of that season generally achieves very poor figures before being redeemed in the second half of the season post Christmas when, following Buck Rogers conclusion, the series receives much healthier figures reaching a peak with Warriors' Gate 3's 8.4 million viewers. The next really big dip comes, as we've mentioned, in the show's later years, 1987-1989 when it achieves it's lowest viewing figures opposite Coronation Street.